These are actually really old photos that I found on my hardrive while shamelessly trying to reorganised my files. I need to start naming things properly other than shdskfkshfhf.jpg. It doesn't make finding the files I need very easy, Sigh. As you can see these are super old, I don't even have my other wrist piercing yet, and my hair is nowhere near as blonde as it is now! Plus, these photos are quite sunny when it's absolutely tipping it down today in London. I was supposed to get Matt to take my outfit photos today, but he was worried about getting his hair wet. Boys and their hair! Anyway, I wear this jumper all the time, but I'm not sure if I've worn it on the blog before or not. I love leopard print at the moment, and this neon pop is right up my street. I paired it with little pointed heels, a clutch and a pair of leather trousers. I'm going out for drinks tonight, I'm very tempted to change into this (with boots and a coat of course!) to wear out. I just like the mix of being able to wear it in the day and in the evening! And I couldn't resist including this super cute photo of my little Aerys! I got a new lens for my camera, and I have been snapping away at her all day. She's grown so much the past few weeks I cant even deal with it. She's such a character and so loving and sweet. She's a nightmare at times as she loves attacking my hands as I type, but she really is a sweetheart at the end of the day! that nail colour is amazing! This is definitely one of my favourite outfits you've posted on this blog and I've been reading for a longggg time! It just really suits you. I've got that clutch but haven't ever used it but you've inspired me to pull it out soon! Awww i remember when my cat was that small, she is about 2 and a half now, but it only feels like yesterday when she was a kitten! Love this outfit! Oh my god this look is so fab !!! You are amazing ! Cute! I love your nail color! love the sweater and that cat is soooo gorgeous! Leopard print is always a winner! Argh!! It's the details that make your outfits so perfect.. That colour on your nails is just amazing. Oh, and Aerys.. Too. Frikkin. Cute. Your kitten is so cute - I love your nail polish here. Those nails and that clutch- it's love! Haha I do the whole hsddbftcd.jpg thing too! Great selection! Love your look book.... Cheers. Really cute outfit and I love that nail colour! That jumper is so amazing! I need it in my life! You are rocking this look. I just can't get over that jumper. Love the outfit. And your cat is such a cutie! Adore your cat and the colour of your nails!! In love with your trousers, and cat!! i enjoy this look a lot! haha :) love the jumper, and Aerys is looking cute as always! I love the print on this jumper! It's not your typical autumn colours, which is why I think im attracted to it! 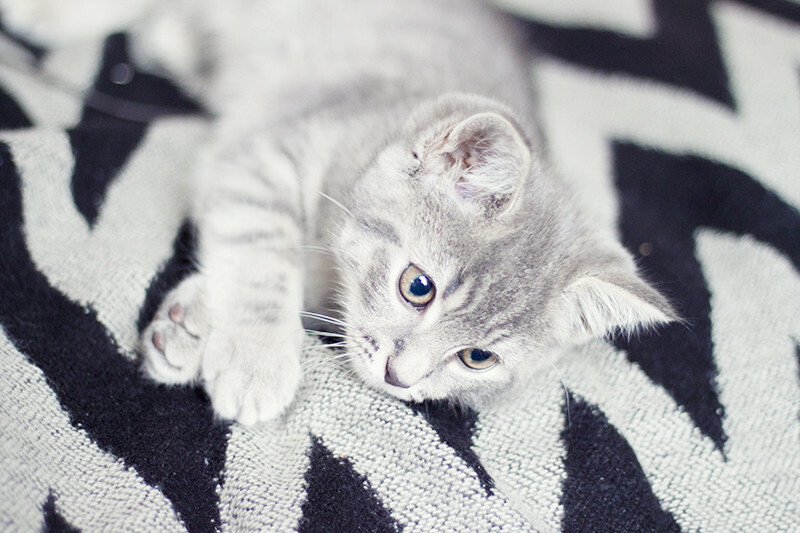 Love the bonus photo of your kitten! I loove this sweater! It´s so pretty but kinda edgy too! Awesome! Aw, you look really good. I don't usually like leopard print all that much but I'm loving the colour this season :) makes autumn clothing less dull!